And third, notice how I added a whole new “gadget program” to my desktop. You might be wondering how I did all these changes to my simple windows desktop. Well lets get started. This allows you to unzip files fast and easy. And it is something that all comes in handy. 3. To get a similar dock like mine go to: http://rocketdock.com/. Once you get there watch the video, and download the dock. One you have the dock play around with the settings until you get what you want. Remember that the icons and skins can all be changed to whatever you want. By going to the Get Addons Page you can get all of these and find ones that you like. You can always add more/delete ones at your choice! 4. 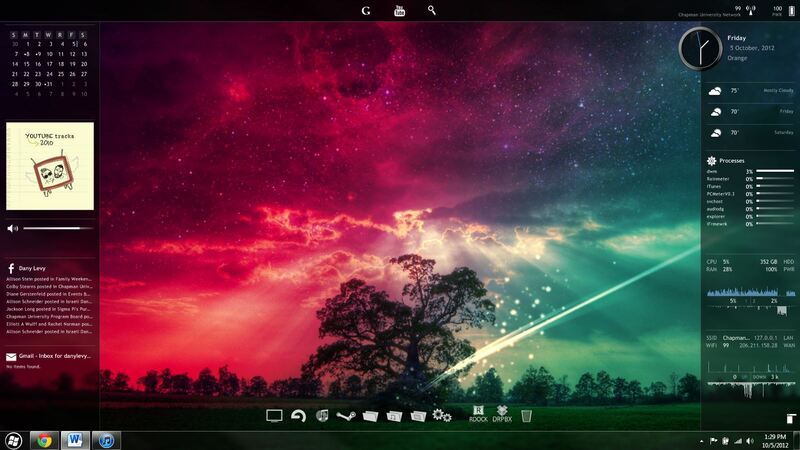 Lastly to get a similar gadget look like mine you need to download Rainmeter 2.4 beta. By doing so you will have the program that allows you to insert many kinds of gadgets/skins how ever you want to. The theme I’m running is called Enigma. This only works on 2,4 beta, so make sure you get the beta and not the 2.3.3 final version. 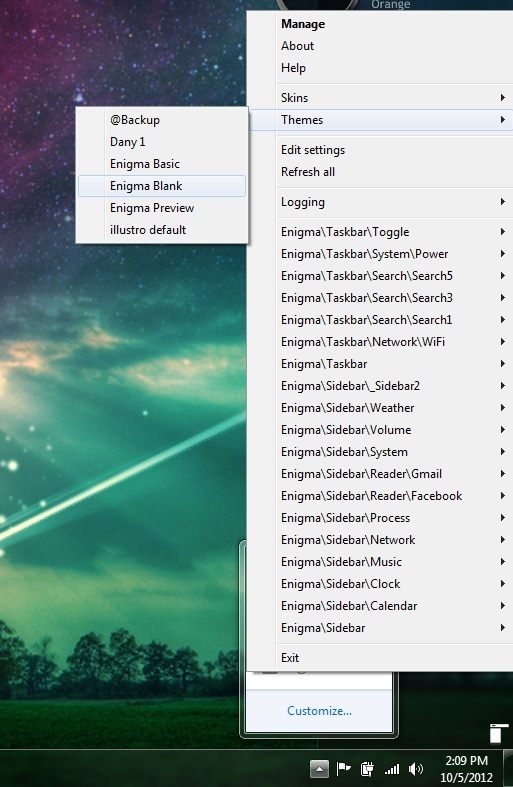 Once you have that installed you can apply the theme by right clicking on Rainmeter/themes/then enigma preview. This will apply Enigma and is ready to be customized. Go through all the setting until you get what you want. Remember its not easy. This is probably the hardest part in customizing your desktop. It takes time, be patient, ask questions, google things, and ask me if you need help. Stay posted for more review and tutorials! Wow, this is really cool! I may even try it out sometime when I have the time. I really like the step by step instruction and that you provided all the necessary links to do this. I really hope you post up more tutorials of cool ways to set up computer displays (can’t think of any examples at the moment). :O This makes me want to use PC more often!